Manufactured in Grande-Bretagne from 1922 until 1928. 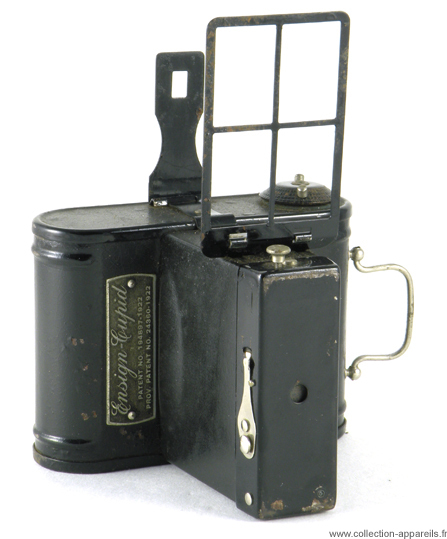 This camera, the forms of which defies human understanding, is made from thin metal sheet, which allowed extravagances. The direction of the plate, handle, viewfinder, the position of the trigger, nothing seems very thoughtful and if there were no laws of gravity to help us, we might ask in what sense it must be used. For those who may have the idea, I immediately undeceive them, it is not a panoramic camera presented in the wrong direction. Its views only measure 4 x 6 cm. French collectors may misunderstand the meaning of the name Cupid (equivalent of stingy in French),... love makes blind.